If you happen to be a Sprint customer and you have a taste for music, you’ll probably want to check out the rich set of exciting new stuff found with Sprint Music Plus. 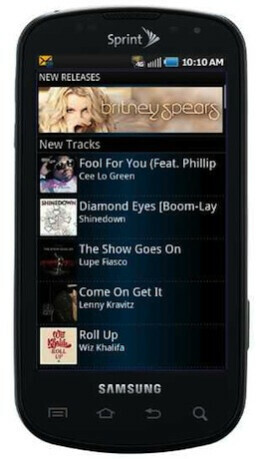 Available in app form for Sprint Android, BlackBerry, and Java based devices released after May 2010 or through Sprint’s web site, it’s one way of being able to discover and manage a variety of music related items. Essentially, you can browse through a variety of songs in its store, create playlists, and even have the ability to preview tracks beforehand. Conveniently, songs are priced between $0.69 to $1.29 for each one, but if you’re looking to purchase quite a few things, you can buy DRM-free songs and ringtones at a reduced price with a bundle. Of course, all purchases are going to be charged directly to your Sprint bill – so you’d better keep a close eye on how many you download. So if I download these songs then switch to another carrier, do I lose all my songs? If so, it seems that Amazon's cloud is a better deal and the prices are competitive. People still pay for music? ?